Did You Know: Around 80% of a businesses IT expenses can occur after the initial cost of purchasing hardware? This statistic was found by Gartner Inc, a global leader in technology research and consulting, and it forms a very important piece in the IT expense puzzle. It also highlights that effort to reduce IT expenses could be wasted by looking at the wrong part of the puzzle. For example, how many people try to reduce their IT expenses by purchasing cheaper, lower quality IT equipment? Cheaper IT Equipment is Not the Fix! Although it can seem like the obvious silver bullet solution, it could in fact have the opposite effect! Buying cheaper, potentially lower quality equipment may actually weaken your IT system without addressing the elephant in the room – the ‘post purchase’ IT expenses. 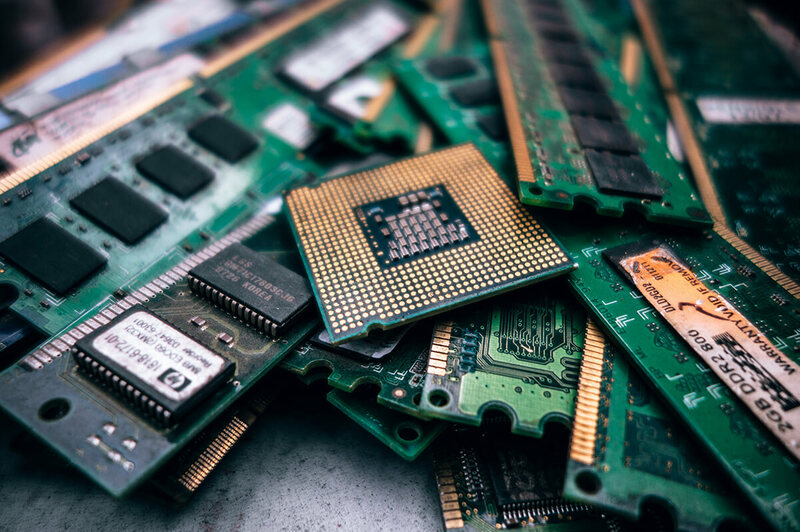 Or worse, focusing on the cost of your equipment could even increase ‘post purchase’ expenses, due to less efficient, effective and manageable IT hardware! Before putting your hardware budget on the chopping block, you should be looking at your IT expenses from a holistic view. With a strong understanding of where your IT expenses are flowing from, you can do something to stem the bleeding. To find this out you need to understand the total cost of ownership, or TCO, of your IT network. The TCO of your IT network includes the initial IT purchasing price, plus all the ongoing management costs for the complete lifecycle of the IT equipment. And as Gartner Inc. found, the ongoing management costs can make up a very significant part! 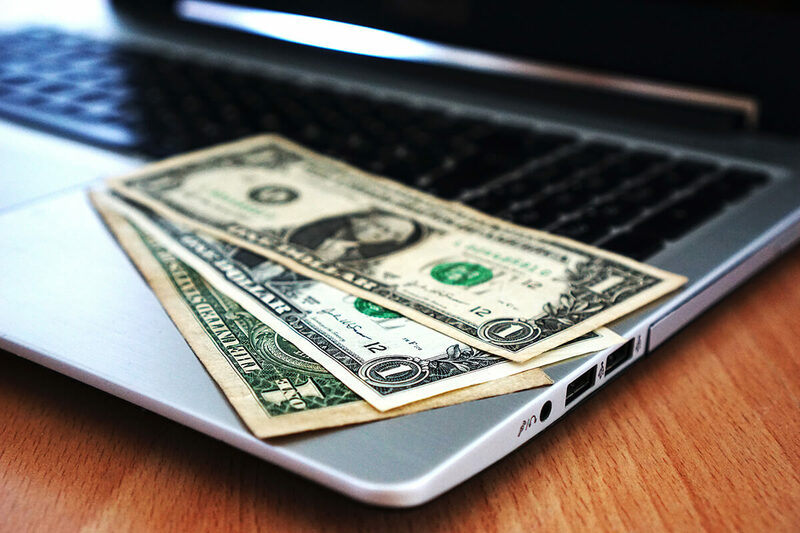 Gartner Inc found that in some cases, a poorly managed PC can have ongoing costs of around $5000 USD each per year! That’s not to say employees aren’t doing their job, it’s just they aren’t all trained to efficiently deal with IT issues. Another study found that employees spend around 30 minutes per week trying to fix PC issues (both their own and co-workers). And you know the saying, time is money! So, moral of the story……initial equipment purchase costs are just the tip of the iceberg in terms of overall TCO. Hiring a full time IT support employee (but this can further blow out IT expenses, we’ll explain in detail below). Outsourcing IT management to an IT Support Company. More often than not, outsourcing IT management to an IT support company is the best way to go. Here’s an explanation of why. Keeping an IT professional on staff, as opposed to outsourcing to an IT support company, may not be a very cost effective solution. For example, the salary of a full time IT staff member may be higher than other employees, but their workload and their ‘bang for buck’ may actually be less (depending on the frequency and magnitude of your IT issues). The potential costs could outweigh the benefits. However, when outsourcing to an IT support company, the benefits usually outweigh the costs (if you choose the right one, that is)! You only pay a fraction of the cost of a full time IT staff member, but you get the benefit of a 24/7, ‘365 days a year’ proactive IT professional supporting your business. On top of that, there’s no sick leave, annual leave or long service leave expenses to worry about. upgrading your facilities and technology. If you’re currently handling all IT support internally, your focus is divided between various priorities. This can make it hard to concentrate on the primary properties and timeframes of your business. Basically, to meet primary priorities and timeframes, you must to be able trust in your IT infrastructure. You need to know that any IT headaches will be dealt with efficiently and effectively. By removing all these IT headaches, company executives can free up valuable headspace, which can be dedicated to steering the business in the best direction. Dealing with these concerns is the bread and butter of a good IT support company! But, remember that not every IT support company is the same! Once you decide to go down this path, the real question becomes, which IT company should you choose? Choosing one which doesn’t fit your organization can be an inefficient use of time and money. Exactly what to look for in an IT company! This is perhaps the most important part of the process! You need to have a good idea about the extent of your potential IT issues (i.e. size of your network, costs of IT downtime, IT tools affected etc.). In other words, if you have mission critical IT infrastructure and software, what does it cost you per day if that goes down? As is so often the case these days, Google is a good place to start! Just remember to research thoroughly because online reviews are not always honest, or accurate. Referrals from local companies, or recommendations from someone you trust can a go a long way, compared with online praise. Ensure you do your due diligence check as you would for any other investment. This leads us to exactly what to look for in an IT support company, to ensure you will get the best service for your needs! 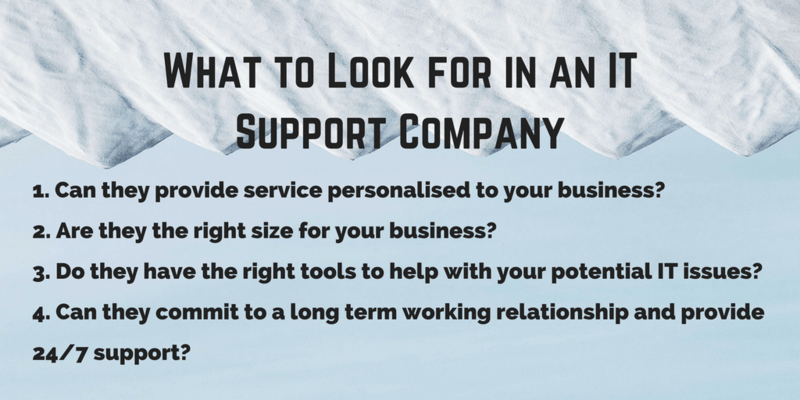 Once you have selected a few potential IT support companies, you need to know if it’s worth your time building a long term relationship with them. These are the things you must look for in an IT support company to ensure they suit your situation, and ultimately help to drive down your ongoing IT management expenses. Can they provide a service personalised to your business? Do they have the right tools to help with your potential IT issues? Can they commit to a long term working relationship and provide 24/7 support? 1. Can They Provide a Service Personalized to Your Business Needs? This includes things like the type of support they provide, contract terms, their ability to provide dedicated staff and their range of contact options. This refers to the support approach offered by the IT support company. For example, if your IT support requirements are widely variable week to week, a pay-as-you-go support system can address the issues and adapt to variability probably best (usually billed per hour or fixed price). The risk here is that costs can be blown out by difficult, time consuming IT problems, or multiple unsuccessful attempts at fixing the same problem. If your IT issues are rare, but potentially catastrophic to business, you can seek a ‘break-fix’ support system (which can work like an insurance policy). However, break-fix support doesn’t address less severe day-to-day issues which build up to create major IT expense! A more balanced solution is managed service support, paid yearly through a subscription service, for example. 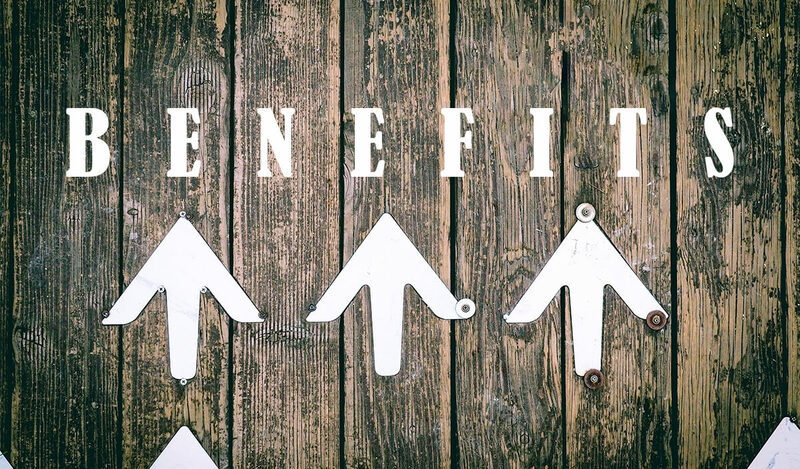 This approach ensures your day-to-day IT expenses, plus the more rare but severe issues can be managed, without unexpectedly blowing out your costs! The big advantage of managed service support is, it encourages the IT provider to be proactive in their service, because unexpected IT issues or repeat attempts to fix a recurring problem is actually as detrimental to them as it is to you. Whereas, IT support companies using pay-as-you-go and build-fix approaches can benefit from your IT woes. This will determine whether will you be locked in for a specified period of time, or if you have a short term bail out clause (usually around 1 month). If you have a very good grasp of your IT support needs, and trust the IT support company’s track record, then a ‘locked in’ contract can be suitable. However, if you are not able to predict your IT support needs, then a ‘bail out’ clause may be handy, just in case the contract is overkill. If any manual IT work is required on site (for example installing or manually testing IT equipment), then you will need an IT support company that is able to provide on site assistance and potentially supply IT equipment. You should be looking for companies that effectively retain all relevant info about their customers, for example in the form of a case library. Their case library should explain everything about the customer, as well as documented procedures on how to deal with their IT issues. This means basically any staff member can jump in and support your organization as if they have been dealing with you since day 1. Does the IT support company offer only email support? Can you call them and if so, how available are their lines? 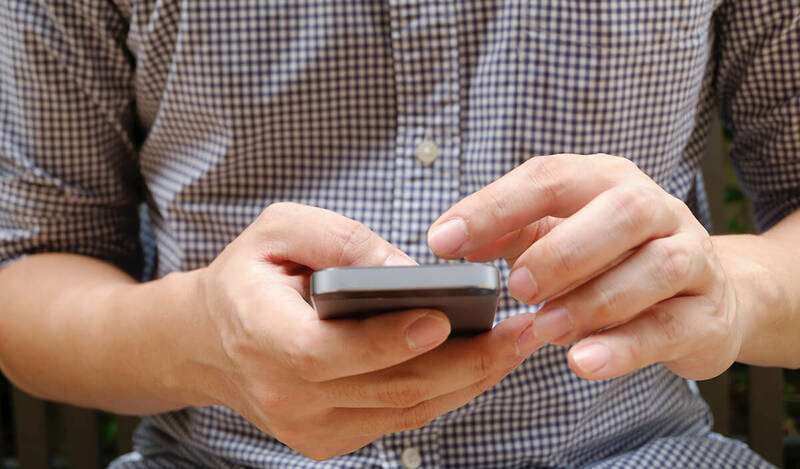 Do they offer a guaranteed response time and how long can you log support calls with them? These are the kinds of things you need to know, particularly if they are a virtual company as opposed to one which provides one site assistance. And, s with the previous point, if the IT issue will jeopardise things like sales or safety, instant support is critical. 2. 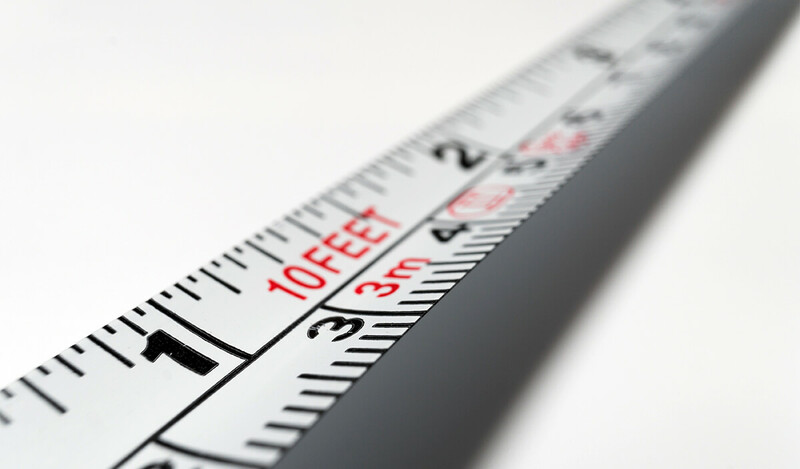 Are They the Right Size for Your Business? IT support companies come in all shapes and sizes, which is why it is important to understand if they are suited to the scale of your potential IT issues. For example hiring a large global group may not be appropriate if your infrastructure only includes a small amount of PCs and one server. Larger IT companies will have a larger knowledge base and more resources. However, the other side of that coin, is that your needs could be a secondary priority to the needs of larger clients. Smaller IT companies may be able to dedicate more resources to your contract. You should also think about your organization’s long-term plans, in terms of growth and direction. Will the IT support company be able to scale along with your business needs? Will you have to switch IT support companies in a few years when your organization expands? 3. Do They Have the Right Tools for Your Business? 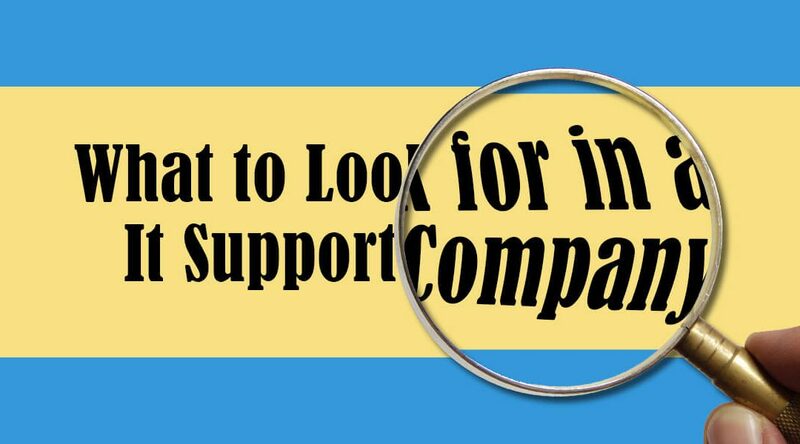 You need to be confident your IT support company is familiar with, and uses the right tools. Do they use customer relationship management (CRM) tools and understand the principles of an effective email system? These are a must if you want to ensure your support questions are adequately processed and archived for future use. Does the company have the tools to provide hardware support as well as software? Will they offer cloud computing services or keep everything off-site? And, importantly, can you see the IT systems they use themselves? After all, you wouldn’t want to consult a doctor who is constantly ill or a gym trainer who is in poor shape. 4. Can They Commit to a Long Term Working Relationship? Ideally, you want an IT support company that will come to understand your business and adapt their operations to your needs. A good sign of this is if they take the time to know your business back to front. Is their consultation process comprehensive, and do you feel like they were focused on your needs? Further, do they have the resources to cope with your needs? The last thing you want is for your needs to be forgotten because they have too many contracts and not enough staff. You can often gauge this by how relaxed their staff are. If they seem stressed, it could be due to a disproportionate work-to-staff ratio (i.e. too much work, not enough workers). Make sure the IT support company has enough staff and time to prioritize your problems for quick fixes at all times. Once again, this is a point that is more likely to be addressed properly when the size of the support company matches your requirements. Finally, the terms of the contract should be as transparent as possible. You need to know what the IT support company covers, and also what isn’t supported in their contract. In particular, the cancellation policy and payment terms and conditions must be crystal clear. Identify the extent of your potential IT issues (i.e. size of your network, costs of IT downtime, IT tools affected and required etc.). If you can’t ID this, then you know you need a highly flexible contract. Identify whether you require virtual or local support. Once you have selected a few IT support companies, comprehensively research their track record, using trusted sources if available. And finally, ask them the right questions relating to ‘what to look for in an IT company’! In short, you want an IT support company that knows and understands your business and IT situation. Likewise, you want to be able to understand exactly what they offer. Now you know exactly what to look for in an IT support company, your chances of finding the ideal IT support contract are high! 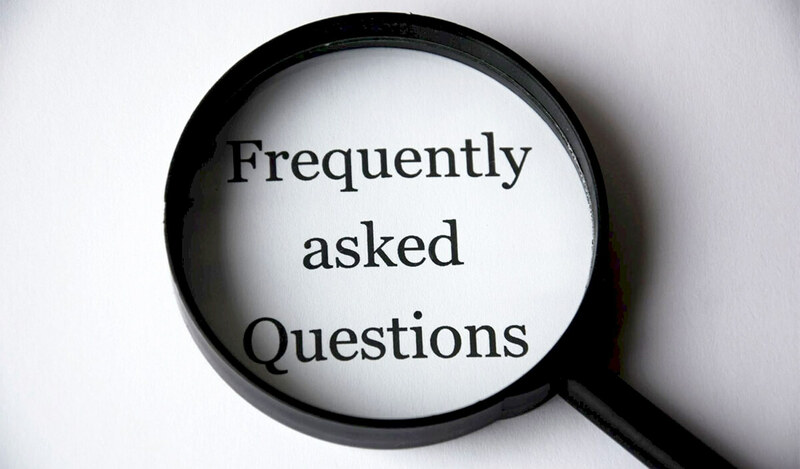 If in doubt, just refer to the list of questions we mentioned; they will help to match a company to your needs, allowing you to make that important long term business decision. Why should I hire an IT support company? It is one of the best ways to reduce ongoing IT management costs. You only pay a fraction of the cost of a full time employee, but can receive support 24/7, 365 days per year. It allows you to focus more headspace towards your organization. Should I go for the biggest IT support company? Not necessarily. While bigger companies will have a larger knowledge base and more resources, if you are not one of their biggest or most lucrative contracts, there is a risk that your company may not get the priority support and personalisation it requires..
A smaller IT support company will often place more value on your contract with them, particularly when your IT support relates to server message blocks. Does the IT support company need to understand my business? Absolutely. The more they understand about your operations, the more precise their support and troubleshooting can become. When choosing the right company, you should ensure that they take the time to know and care about you. Should Your Company Move to a Microsoft Office 365 Subscription?